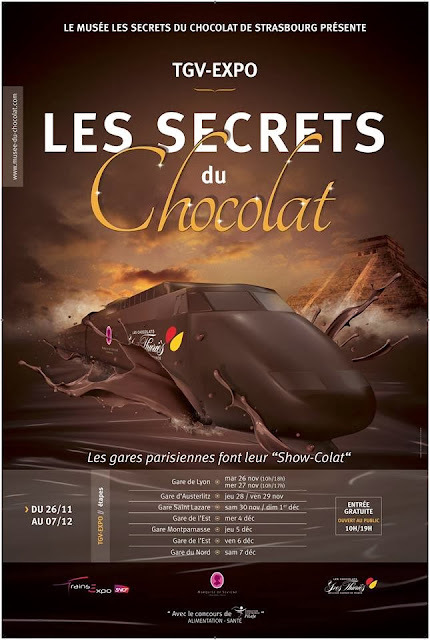 If you commute to Paris or are taking a train during the next week, be sure to look for "The Secret of Chocolate" TGV at the train station. You can't miss it. It's the TGV covered with huge photos of chocolate bars and "Les Secrets du Chocolat" emblazoned in gold on the side. If you have a good sense of smell, you may even detect the tantalizing aroma of chocolate. Divided into three sections, the first part of the FREE exhibition is devoted to the history of chocolate. The journey begins in South America, where the Mayas and Aztecs used cocoa beans as currency and made a rich drink from cocoa powder mixed with spices and water. Colorful photos and interactive screens trace the production of chocolate from cocoa plantations to factories that use specialized machines to transform it into delicious treats. Since I made the mistake of going during lunchtime, I spent quite a bit of time in the car devoted to the history of Marquise de Sévigné chocolate when the movement of the line came to a halt because everyone wanted to linger in the next car. That's where Yves Thuriès, who was twice awarded “Meilleur Ouvrier de France” (Best Craftsman in France), was revealing some of his secrets and inviting visitors to sample chocolate. In case you're worried about indulging before the holidays, nutritionists from the Fondation PiLeJe are on hand to explain the scientifically proven health benefits of chocolate. And, best of all, chocolate makes people happy! Please note that all of the signboards are in French and that the exhibition space is confined to the interior of a TGV. If you're at all claustrophobic, I recommend getting your chocolate fix elsewhere. Click here to see more photos from "The Secret of Chocolate"
Looks yummy! I would NEVER feel claustrophobic surrounded by chocolate.